Ensenada has a mild, sunny climate; outdoor cafes, restaurants and bars line the pedestrian-friendly main street. Head inland one or more blocks and you’ll find a typical, unassuming Mexican town. Highlights of a day or weekend in Ensenada include the Riviera del Pacífico Cultural Center. Built in the 1920s as a gambling casino, it’s used mainly for events, but has an inexpensive and well-done history museum, lovely gardens, and an old-fashioned bar. Ride along the coast highway in a horse-drawn carriage (look for them by the “Giant Heads” park, which sports giant golden busts of Benito Juarez and two other heroes). Across from the cultural center on Boulevard Costera, Galería Perez Meillon sells museum-quality baskets and pottery made by the Kumeyaay Indians, and the owner gives classes in wood block printing. For those whose idea of a cultural immersion is to hang out in a popular bar, Hussong’s Cantina, in continuous operation since 1896, has a varied international clientele and a killer margarita---Mexico’s most famous drink made of tequila, fresh lime, and orange liqueur. 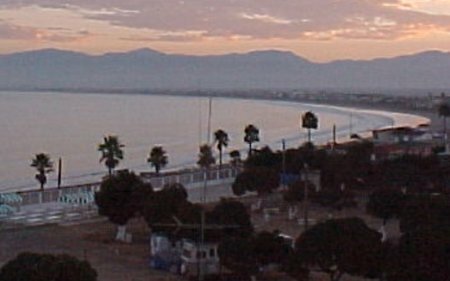 Unlike the beach-and-bar-oriented town Rosarito, 75 km (47 miles) to the north, Ensenada has grown up naturally and slowly over the last several centuries. Ranchers grazed cattle and sheep, and there was a brief boom when gold was discovered. Mainly the industrious townspeople stuck to farming, irrigating their crops with runoff from the Sierra San Pedro Mártir Mountains to the south. Today the most important industries of this port city of fewer than 300,000 people are shipping, fishing, agriculture and tourism. Cruise ships (including Disney and Carnival lines) berth here on short tours out of Southern California. Day trippers add to the bustle of downtown Ensenada, sticking mainly to La Costera, the busy boulevard that runs adjacent to the port, and Avenida López Mateos (AKA Calle 1), which is almost exclusively dedicated to shops, restaurants, bars and a smattering of hotels. Encouraged by the cruise ship trade, city planners spruced up Avenida López Mateos in the 1990s. Tourists from cruise ships and weekend visitors stroll up and down, shopping for stained glass, knock-off Gucci handbags, and a surprisingly similar assortment of low-to-medium quality crafts. There are a few appealing shops along López Mateos, however, so don’t give up too quickly. On the coast road, visit the fish market (great for photo-ops and smoked marlin by the kilo). Whale-watching and fishing charters are found here also, at the town’s busy port. This is not a beach town; if you want to relax near the ocean, visit one of the resort hotels or surf spots north and south of Ensenada. South of town, the coast road follows the curve of enormous Bahia de Todos Santos (All Saints Bay) to Punta Banda and its famous blowhole, La Bufadora. For more things to do as well as hotels and restaurants, check out our Ensenada Travel Guide.